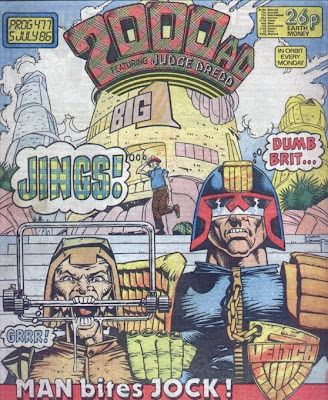 Of all the Dredd volumes written by the John Wagner/Alan Grant team, this is by far the most inconsistent: its high points are very high, and the low points are unusually sloppy. 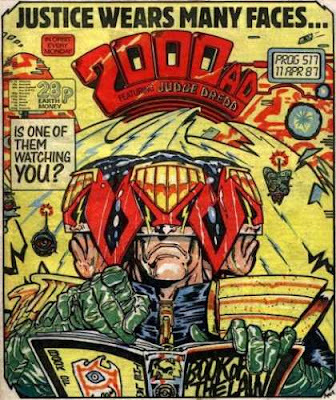 1986 was a turbulent time for 2000 AD in general--publisher IPC's Youth Group had been moved to a new building at the beginning of the year (with its art directors separated from editors), and the "British invasion" in American comics was starting to lure top creators away from U.K. publications. 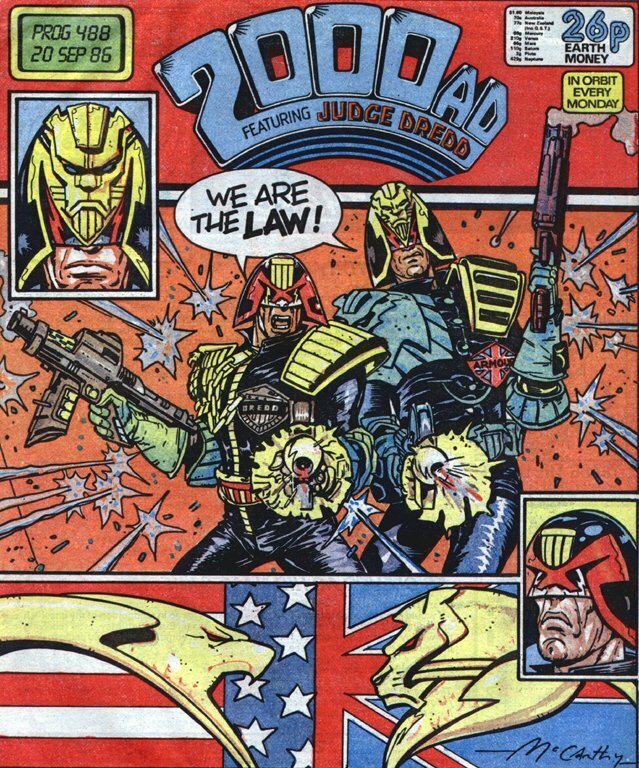 At the same time, the Dredd feature was more in flux artistically than it had been in a long time. These 49 episodes are drawn by 17 different artists. Cam Kennedy draws eight of them, Brendan McCarthy another seven. (A lot of the Dredd covers from this era had nothing to do with the story inside; more than a few were generic, backgroundless action shots drawn by Cliff Robinson.) By the time the final story reproduced here appeared, Wagner, Grant and Kennedy had become part of the British invasion too: they'd been hired to create the miniseries Outcasts for DC. That process evidently wasn't without its bumps, though. The first story Kennedy draws here, "The Art of Kenny Who?," is a very thinly veiled parody of Kennedy's early experiences trying to get work in American comics (wonder who he thought was ripping him off? ), and Grant and Wagner naming the martial arts master who defeats Dredd "Stan Lee" has to have had a touch of bitterness behind it. The McCarthy episodes here stick out from the rest, though. McCarthy's a remarkable artist, especially when he gets to work in color (inexplicably, "Atlantis" was run entirely in black and white). He's also relatively limited in his range. Whatever he draws is a Brendan McCarthy image before it's anything else, and he's much more interested in bombarding readers than leading them through a page. That works fantastically well for covers, and for projects like Strange Days. It's less effective for crime plots like "Atlantis" and "The Witness," in which McCarthy's style and spectacle (and his cluttered layouts) keep kicking the reader out of the story. 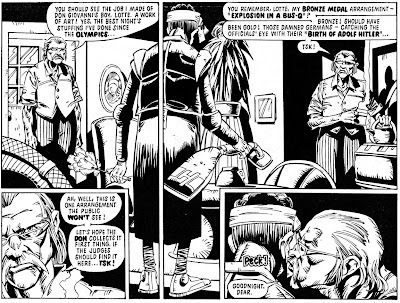 "The Interrogation," the best-looking Dredd story Kim Raymond ever drew, follows up on that terrific apropos-of-nothing scene in "The Executioner" four years earlier in which Dredd grills Judge De Gaulle. (Have we seen her since?) 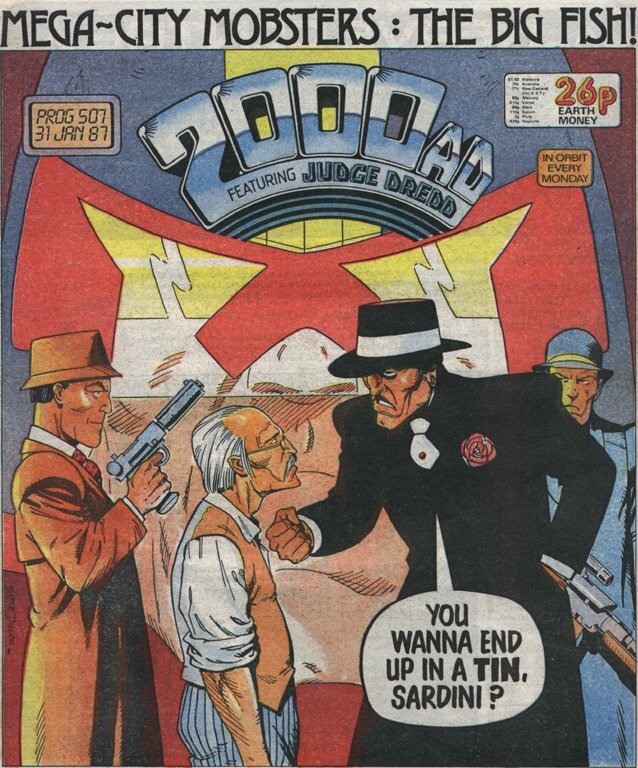 And "10 Years On," which ran in the tenth anniversary issue, Prog 520, revisits the very first printed Dredd story, "Judge Whitey." 520 was also, I believe, the first issue to feature painted color in the center-spread and a slightly different trim size; from that point onward, the black-and-white reproduction in this Case Files volume and the next is even more frustrating than before. Also frustrating: the string of stories, especially in the second half of this volume, on which Wagner and Grant are on autopilot. I could swear that there's been another Dredd story at some point with exactly the same premise as "The Peeper"--busybody with telescope discovers crime, reports it, is told to spy for Justice Dept. 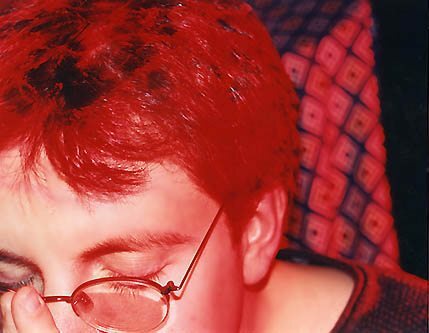 from then on--although I can't recall exactly where. The crazy-robot-on-the-loose story "Phantom of the Shoppera" is immediately followed by the crazy robot on the loose who opens "Tomb of the Judges"; the fourth-wall-breaking and deus ex machina routine in "A Real Xmas Story" are forced; "The Beating Heart" doesn't bother to twist "The Tell-Tale Heart" into anything new; the Michael Jackson and genie-in-the-lamp and blind-monks and time-traveling-Jack-the-Ripper stories are all dumb, lazy writing (although the Michael Jackson one features a rare comedy turn from Garry Leach). The low point is "The Shooting Party," a half-assed retread of "The Hunters' Club." 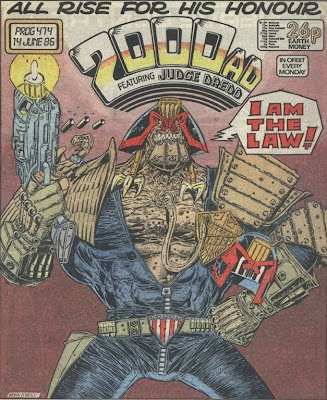 There's some other thoroughly charming stuff here too, like the only Dredd stories Kevin O'Neill has drawn to date, "The Law According to Dredd" and "Varks" (plus his page of "What If the Judges Did the Ads? "), all of which play to his sense of extreme grotesquerie. And the central gag of "Paid with Thanks" (drawn by Ian Gibson under his Q. Twerk pseudonym again) has stuck with me for 25 years now. 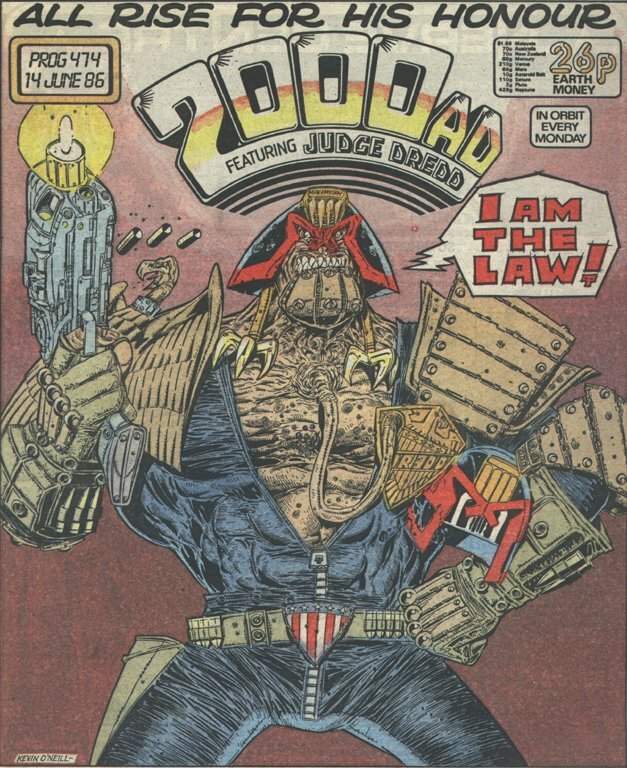 A few more notes: Most of the first ten years' worth of Dredd stories from 2000 AD (with the exception of the suppressed "Cursed Earth" episodes, obviously) have been officially reprinted several times over. Before the Complete Case Files series, the most complete version was the magazine-format Complete Judge Dredd and the Classic Judge Dredd series that followed it. Classic, though, made an abrupt jump: after Prog 519's "Blood Donor," it filled out its fourteenth issue with a Daily Star reprint, then skipped straight to "Oz" (which it reprinted over its final four issues). The final story in Case Files 10, "So You Want to Be a Judge?," is consequently the first that had never been reprinted before the Case Files books. It's actually incomplete here: the final page in the original version was a "cadet application," at the bottom of which Tharg promised that the winner would appear as a cadet in a subsequent issue. 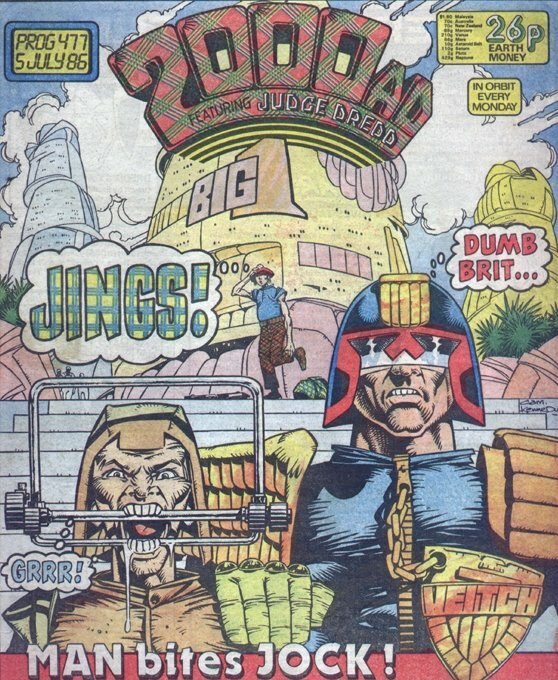 And "The Dead Ringer," from Prog 493, was a little bit of a milestone in its own way: it was the first Dredd story in 2000 AD to be credited to "Wagner & Grant," rather than to "T.B. Grover." Next week: Case Files 11, featuring "Oz"--the Wagner/Grant team's final epic--as well as "Revolution" and the first appearance of P.J. Maybe. The peeping thing gets revisited in an early part of Tour of Duty where they're searching for the parents of a new born mutant baby who've absconded with it. DeGalle's later appearances you've already found.